These cute little guys arrived last week. By special delivery in the mail (USPS is still pretty cool in my opinion…). We nestled them into their new, warm temporary home… the bathtub! Mitch teaches the 2 day old chicks how to drink water. They’re all adorable and they are already growing FAST! We chose to get babies so that they would get to know us and so that the dogs would have some time to get used to them. 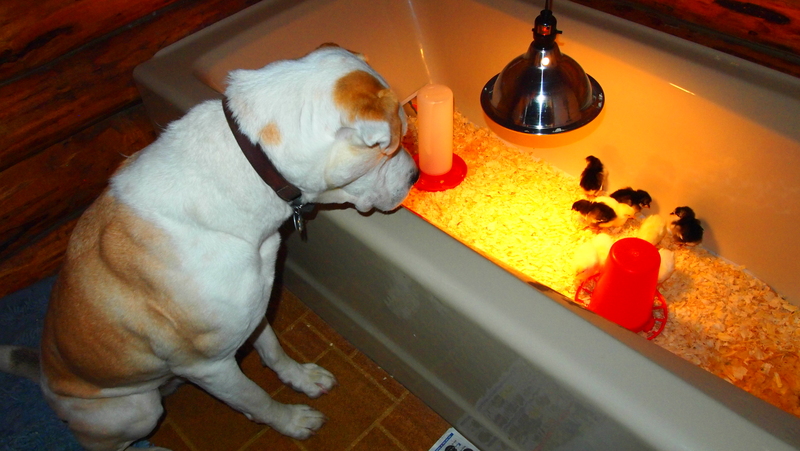 I can just imagine the three dogs rushing outside everyday to bark in the poor chicken’s faces (jerks). Well unfortunately, we already had an accident. Wilbur got one. WHAAAAH!!! I feel horrible and I can’t believe we let it happen. He rushed inside when the door was open before we could even think about it. Before then, I was letting him sniff them at a distance, with dual supervision and a grip on his collar. He was obeying, but definitely obsessed… way too worked up to be left unattended. The ONLY good thing that came from the tragedy is the lesson learned… the dogs and the chickens are not going to be friends and definitely can’t be left together. I do want to try to make the existence between them peaceful, although separate. With barriers. Because the poor babies are never going to be able to defend themselves. And there are a lot more vicious beasts who will be trying their best to get at them… both by ground and by air. Mitch is going to have his work cut out for him reinforcing the coop to keep out coyotes, raccoons, rodents, hawks and obviously, dogs too. I am so mad a Wil, but I know this was my fault, not his. Here is a peek into the peaceful past… before the ‘incident.’ When I was still a naïve and trusting mother.